In the past three years, Chevrolet has won over ten awards for it’s above the bar performance in many different categories, such as most dependable compact SUV, best large heavy-duty pick-up truck, best midsize sporty car, and most dependable small car. All of these awards only support the praise of critics and customers alike. Not to mention that Chevrolet has one of the highest ratings of customer loyalty out of any car brand. With a great and expansive suite of vehicles to choose from, drivers will be able to find exactly what they need in a new car, truck, or SUV from a dependable brand that they can feel confident investing in. For the 2018 model year, Chevrolet has a great lineup of SUVs for drivers to choose from. Whether you are looking for a smaller SUV, a mid-size, or a large SUV to fit the whole family, drivers will not be short on select models to choose from. So, let’s take a look at some of the most popular Chevy SUV’s in order of size. Small SUVs are perfect for people who don’t have a ton of cargo and storage needs, but still, want a little more than they would get from something like a midsize car. Chevrolet has a few small SUVs to offer that are customer favorites among this set of drivers. This small SUV has been popular since it joined the ranks of Chevy SUVs. The Chevy Trax is the perfect vehicle for city drivers. It’s agile, tight steering ability to squeeze into even the tiniest parking spots, and its consistent maneuverability make it a favorite among city occupants who want to experience a little more roominess in their ride while maintaining their ability to drive and park reasonably and easily in the city. The Chevy Trax has a great starting MSRP of just $21,000, is available in 8 exterior colors, and is packed with safety features and user-friendly technology that makes navigation, entertainment, and connectivity easier than ever. Even though this is a small SUV, there are very flexible seating arrangements, that allow drivers to store items as long as 8 feet with the front passenger seat folded down flat. With all of this flexibility, it’s hard to believe that the Chevy Trax is as small in stature as it is. Once again, the Chevy Trax is a favorite of those drivers who want the extra cargo and passenger room, but still, need a smaller vehicle to fit snugly down tight streets and squeeze into small parking spaces. For those who want or need a little more cargo room, passenger space and seating, and a little more towing capability, one of the mid-size Chevy SUVs might be the right fit. The Chevy Traverse is the best of both worlds in SUVs. It has more space than a small SUV but maintains the ability to still not be a huge vehicle. It retains a nice fuel efficiency, starts with an MSRP of $29,930, and its available suite of over 14 active and passive safety features received the 2018 5-star overall safety rating from the National Traffic Highway Safety Administration. The Chevy Traverse is really something to look at and sits among all of the attractive Chevy SUVs in this year’s line-up. Its sculpted sleek styling and ten exterior bold color choices really give the Traverse a special look of its own. Because drivers that choose a mid-size SUV over a small SUV typically want more cargo and seating capacity, the Traverse gives the possibility for seating up to eight passengers, and 98.2 Cu. Ft. of cargo space. For those that want to maximize passenger and cargo room, as well as towing capacity, large Chevy SUVs may be the answer. With more seating, more flexible cargo space, and the ability to take on tough tasks for work or recreation, Chevy has a great lineup of large model SUVs. One of the most popular large SUVs ever to hit the road, the Tahoe is at the top of the Chevy SUV list for many drivers who are looking for a large SUV model. With seating for up to 9 passengers, the Chevy Tahoe gives drivers the ability to go anywhere anytime. Cargo space onboard this Chevy SUV is huge and possibly just as important, flexible. One of the things fans of large SUVs gravitate towards with the Tahoe is that while it still offers the cargo, passenger, and tow and haul capability of its larger competitors, it is slightly shorter in stature that allows for greater maneuverability. In 2018, Chevy added two new special editions to the popular lineup of Tahoe’s. No major design changes have been made to the exterior of the Chevy Tahoe since the 2015 model year, and it still looks just as good as it did upon this model year’s release. The Tahoe comes standard with an impressive 5.3 L 8-cylinder engine to back up all of that tow and haul capacity and gives drivers an EPA estimated 16 MPG and 23 highway MPG. Safety is all covered with full-coverage airbags, and great traction and stability control for a smooth and precise ride in multiple weather conditions and all kinds of terrains. One can’t talk about large Chevrolet SUVs without talking about the Chevy Suburban. This SUV has always been a favorite of Chevy customers looking for a large SUV with dynamic towing capability, spacious passenger seating for up to 9 people, and high-performance powertrain combinations that power it all. The Chevy Suburban is a V8 with a fuel economy that is best-in-class at 23 highway MPG as estimated by the EPA. It’s perfect for families and anyone who needs a lot of passenger space, flexible cargo room, and the ability to really tow anything drivers would need for work or play, on daily tasks, work equipment, and recreational weekends away. If you are in the market for a Chevy SUV, Carl Black Kennesaw is here to help get you into the perfect Chevy SUV for you. With a huge selection of large, mid-size, crossover, and small Chevy SUVs, drivers will love the inventory available at Carl Black Kennesaw – almost as much as our customers love our expert and caring sales team. We strive t0 create a stress-free shopping experience and get to know your personal tastes, needs, budget, and more so you can feel confident in the Chevy SUV you choose. 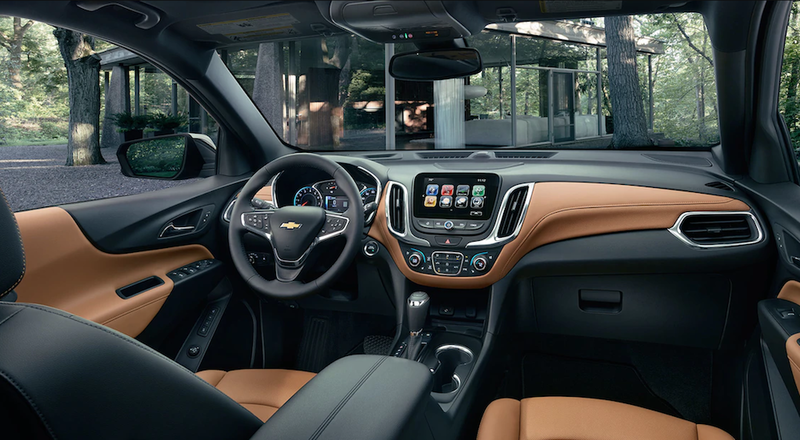 Once you pick your new Chevy SUV, our knowledgeable and resourceful team of finance experts will help you secure the lease or loan that you need depending on the price of your vehicle, your down payment, and your desired monthly payment. Even if you have less than perfect credit, our finance team will help you get into the vehicle you need. Once you drive off of the Carl Black Kennesaw lot, our customer service care does not end. Our service staff will always be available to help you with all of your routine maintenance, service, and repairs.